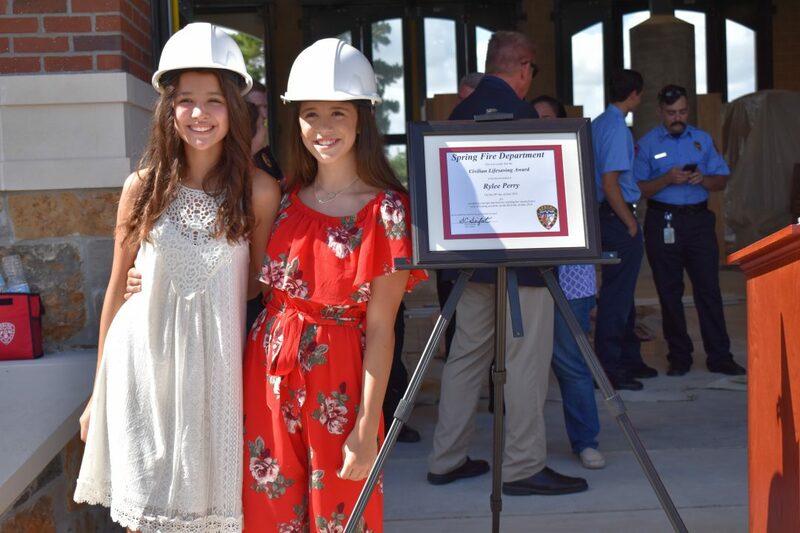 For her heroic actions while saving her cousin, the Spring Fire Department honored 12-year-old Rylee Perry with a Civilian Life Saving Award on June 28. On June 3, Perry and her cousin, Cali Christopher, were swimming together — as they have for nearly their whole lives at Perry’s home. When Perry’s mother and stepfather went inside for a minute to get a plate for their barbeque, Christopher went underwater. After about 20 seconds, Perry noticed something was wrong. Quick-thinking Perry pulled Christopher out of the pool and got her parents to dial 9-1-1. Spring Firefighter Blake Thompson, who responded to the call along with Cypress Creek EMS, rode with Christopher in the ambulance. He credits Perry with saving her cousin’s life. This heroic incident shows how important it is to always swim with a buddy at any age. Christopher’s mother, Bethany Kucera, said she would have never expected something like this to happen to her daughter, but she is grateful Perry was there to help. A large group of family members along with the Spring Fire Department and Cypress Creek EMS crews who responded to the call came to see the award presentation at the new Station 75, which is scheduled to open in the fall of 2018. “I think it just brought us more together. It brought our whole family together,” Christopher said to KHOU. During the award presentation, Spring Fire Chief Scott Seifert said he felt honored to present this award because he lost his father in a drowning when he was nine years old. “That courage and that bravery makes me so proud and I can tell you that she’s my hero,” Chief Seifert said. KTRH Newsradio named Perry their winner of the day for her heroism. Morning News host Jimmy Barrett, who served as Master of Ceremonies for the award presentation, honored Rylee for using the buddy system. While Perry was flattered by all the attention, she says she was just glad to have her cousin with her. “I feel like a hero but at the same time I just did what I had to do to save my cousin,” Perry told KPRC news. Hannah Falcon is a sophomore Communication major at Texas A&M University. A Staff Writer and Life & Arts Editor for the Texas A&M Battalion, Falcon is spending the summer as a volunteer writer for Spring Fire Community News.